All states have laws and rules regarding the operation of snowmobiles. The following is a state-by-state summary of these rules. For the latest information on local laws and rules, please contact or visit the state association's web sites. There are 500 miles of groomed trails in Arizona. The Arizona Department of Transportation Motor Vehicle Division (MVD) is the issuing agency for the OHV decal, certificates of title, registrations, and license plates. Arizona Law requires all vehicles used off highway and meeting the criteria listed below to display an off-highway vehicle decal. The vehicle is designed by the manufacturer primarily for travel over unimproved terrain. The vehicle has an unladen weight of eighteen hundred pounds or less. There are 1,800 miles of groomed trails in California and Nevada. Trail permits are not required for out of state snowmobilers. All roads are open for snowmobilers to use. Road shoulders & road ditches are not open for snowmobilers. Helmets are not required. There are no posted speed limits. 15 mph speed limit in congested areas around lodges. Snowmobiles must be licensed or purchase a non-resident permit if your state does not require licensing (i.e. Nevada). Registration Fee: $21 for two years. There are 2,500 miles of groomed trails in Illinois. Trail Permits are not required for out of state snowmobilers but registration from the state of residence is. All roads are not open for snowmobilers. Snowmobilers are allowed to ride within 10 feet of the paved roadway only when crossing a bridge or culvert or allowed by local ordinance. May legally ride in the road ditches of most roadways. Helmets are not required. No posted speed limits. Snowmobiles must have adequate mufflers and operating brake lights. DUI Law is the same as for automobiles; the blood alcohol content limit is .08. Registration Fee: $30 for three years. Indiana snowmobile trails are provided through the cooperation of local snowmobile clubs, the Indiana Snowmobilers Association, and Indiana Snowmobilers Association the Indiana Department of Natural Resources. The snowmobile trails are open in December, January, February, and March when snow conditions are adequate and the trails are posted as "open." There are trailheads at each trail for parking vehicles and trailers. Only registered snowmobiles may be used on the trails. The Department of Natural Resources' Indiana Snowmobile Trails Program is completely funded by snowmobile registration fees; law enforcement activities, including the Snowmobile Safety Course, are also funded by the registration fees. The cost of registering a snowmobile in Indiana is $30.00 for 3 years. Snowmobile trails are open from December 1st to March 31st only when the trail is posted as "open." All snowmobiles must be registered. The use of trails by wheeled vehicles is strictly prohibited. All Indiana Snowmobile Laws (Indiana Code 14-16-1) must be obeyed. Snowmobiling on county roads is allowed in some counties. 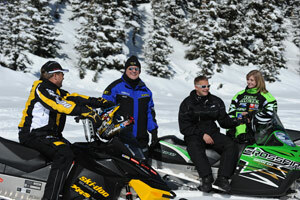 The sheriff's office of each county can provide up-to-date information on its snowmobiling laws. Some trails may use county roads as part of the trail. All road laws, including holding a valid drives license, must be obeyed. There are 22,000 miles of groomed trails in Minnesota. Trail permits are required for all snowmobiles at $36. per season. Permits can be purchased at Electronic License System agents, by mail, online or by phone at 888-665-4236. 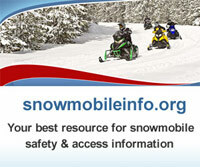 For more information, go to the MN DNR Website at http://www.dnr.state.mn.us/licenses/snowmobile/trailpermit.html. Helmets must be worn by everyone under 18 years old. Roads and shoulders are not open for snowmobiles. Snowmobiles are allowed in road ditches but travel must be with the flow of traffic after dark unless on a two-way signed trail. The speed limit on the road sets the speed limit on the trail. The maximum speed limit for a snowmobile in Minnesota is 50 mph. No metal traction devices are allowed on blacktop trails unless trails are specifically signed to allow them. Any Minnesota resident snowmobile rider born after 12/31/76 must possess a snowmobile safety certificate. 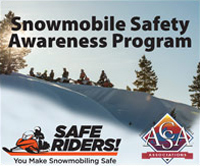 For out-of-state riders, anyone 12 and 13 years old must have a safety certificate to ride but may NOT cross state or county roads; anyone 14 through 17 must have a snowmobile safety certificate to cross state and county roads; and anyone 18 years old and older does not need a snowmobile safety certificate. Nonresidents certified in snowmobile safety training in another state will be recognized in Minnesota. There are 7,000 miles of groomed trails in New Hampshire. Trails permits are not required but registration is. Registration is available through the Department of Fish and Game at 603-271-3129. Helmets are required for operators and passengers 17 years old and younger. Only certain roads and/or portions are open when applied for by local club or the Bureau of Trails. When they are open, they are posted. Otherwise all public ways are closed. Same rule applies for open road shoulders and ditches, still within the right-of-way. There is a 10 MPH speed limit at trail junctions, parking lots or when passing trail grooming equipment. Speed limit is 45 mph unless otherwise posted. 10 mph when within 150 feet of any fisherman, their shanty or fishing hole. Also, speed that is reasonable and prudent for conditions then existing. Black Lake in Pittsburg has a 35 mph night time speed limit. There are over 1,200 miles of groomed and signed trails in Utah. The Utah OHV laws exist to promote safety and protection for persons, property, and the environment involved with their use. The following is a summary of some of those laws and some other basic information. For a complete list of Utah OHV laws, contact Utah State Parks. No person may operate or transport and no owner may give permission to operate or transport any OHV on public land unless the OHV has current registration. Registration stickers with base decals must be displayed on both sides of the snowmobile hood or pan. Registration papers must be carried on the sled. NOTE: Your annual $23.00 Registration Fee is spent as follows: $2.00 to the OHV Education Program, $2.00 to the Department of Motor Vehicles, $.50 to Search and Rescue, $1.50 to SITLA fund and $17.00 to Utah State Parks for all programs including grooming operations and enforcement. A person under the age of 18 years must wear a properly fitted, safety-rated helmet whenever operating or a passenger on a snowmobile or OHV. Operators 8 to 15 years of age must complete the Utah State Parks off Highway Safety Education Course before operating a snowmobile. Call 801-538-7433 to sign up. OHVs may not be operated on any street or highway not designated as open. Dealer registrations are valid only when demonstrating on OHV to a prospective purchaser and shall not be permanently attached to the vehicle. There are 4,750 miles of groomed snowmobile trails in Vermont. Snowmobiles must be registered in any state or province and must display a valid VT Trail Permit, referred to as a Trail Maintenance Assessment or TMA . A TMA is required and can be purchased from local Vermont Association of Snow Traveler's (VAST) clubs. The VAST cost for a TMA is $130 for non-residents and $100 for residents. To buy a TMA you must belong to a local club which costs an additional $10-$20 and there may also be a County charge as well. TMAs include VAST, County and Local Club Membership and it is your permission to operate on private land. If a snowmobile has an aftermarket exhaust, that exhaust must meet the same requirements that the original manufacturers exhaust met and written certification of that must be carried in the snowmobile at all times. Riders must also have proof of liability insurance in the amount of $25,000/$50,000/$10,000 to operate on the Vermont Trail System. Proper head and face protection is required. Roads are open to snowmobiles only when marked and signed as a designated trail. Speed must be within a reasonable and prudent manner with the exception of state lands where speed limits are posted at 35 MPH. Further information is available on the VAST website (www.vtvast.org) or by calling the VAST office at 1-800-734-8278. There are over 25,000 miles of groomed snowmobile trails in Wisconsin. Trail permits range from $10 to $30 annually. Non-resident snowmobile trail pass are $50 and is valid from July 1st through June 30th. A snowmobile trail pass is required to operate a snowmobile not currently registered in Wisconsin on a snowmobile trail. The snowmobile must be currently registered with another jurisdiction. Snowmobile Registration fee is $30 for 3 years.